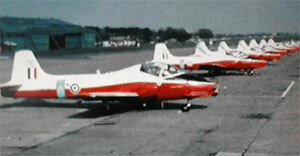 The British Aircraft Corporation (BAC) developed a light jet trainer, the jet Provost, with side by side cockpit. 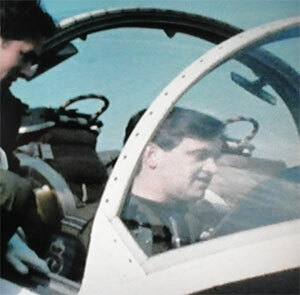 There was a need for a light ground attack aircraft for both the Royal Air Foirce and for export in the nineteen-sixties. 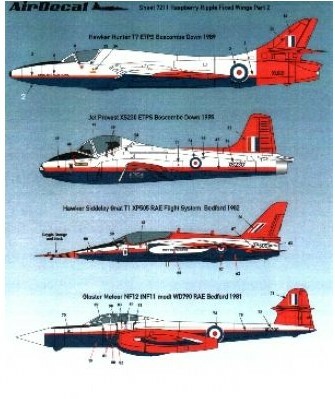 The RAF trainer version, called Jet Provost, deliveries were completed in 1972. 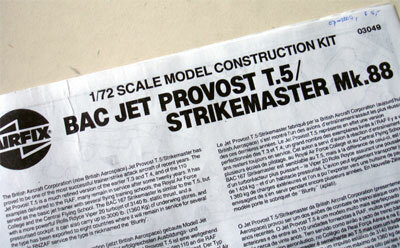 Airfix had issued many year ago a 1/72 model of the the BAC Strikemaster / Jet Provost T.5. (kit 02044 and later kit A03049). 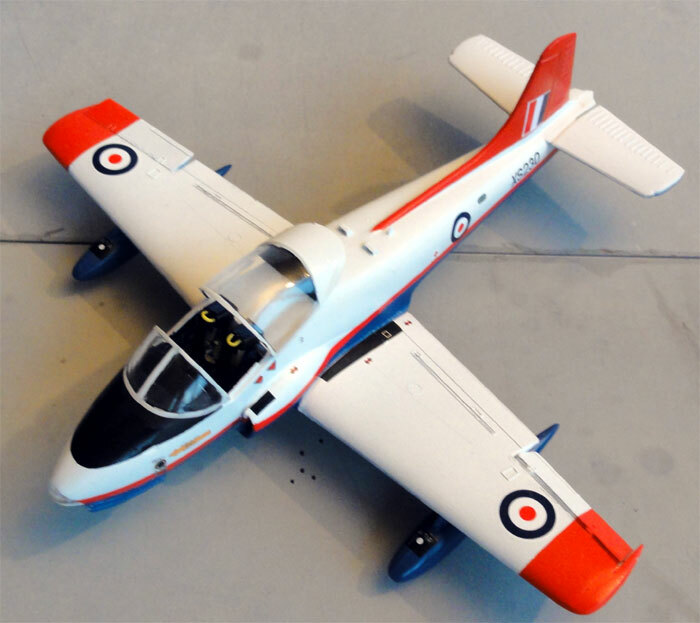 Basically it is the same aircraft, but the Jet Provost was used as a trainer and the Strikemaster as a light ground attack aircraft. 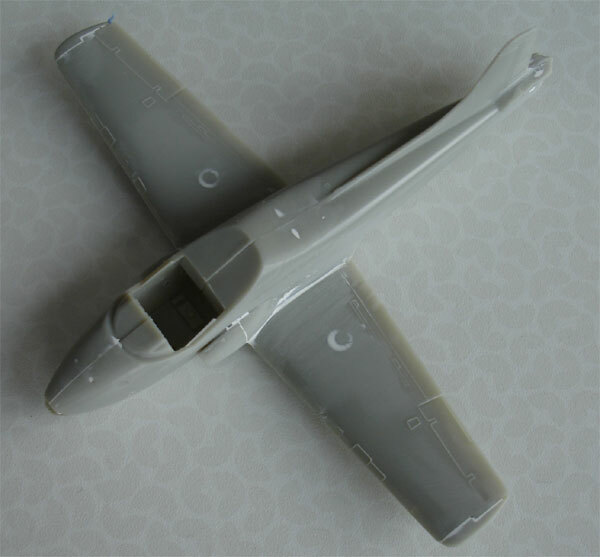 In the kit some small parts are included for each type: a couple of different air intakes and wingtip tanks. 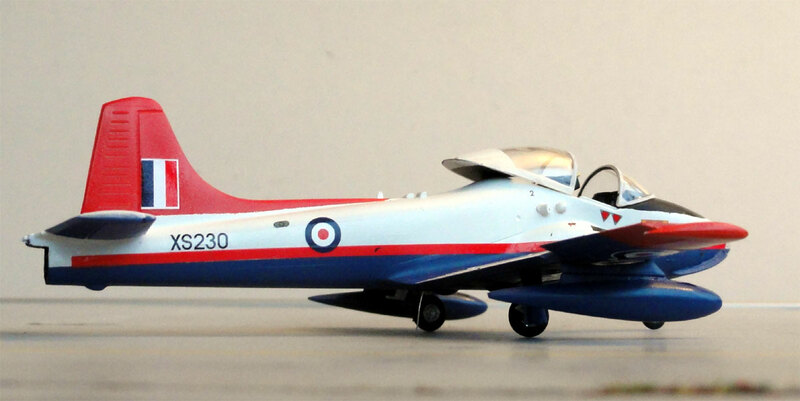 The Strikemaster also had stronger undercarriage, could carry weapon pylons and also did not have the nose strakes. 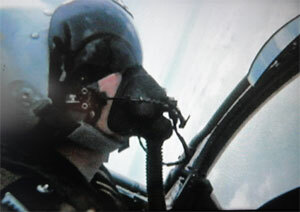 It usually had blast deflectors below the intakes with two small guns below the intake. 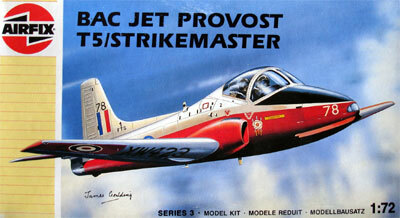 (note that Airfix also had another Jet Provost T.3 kit #01029, seen on page 2...). 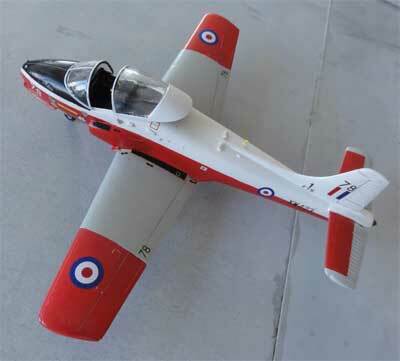 Two older kits are built as Jet Provost, an old kit and a later bought kit. 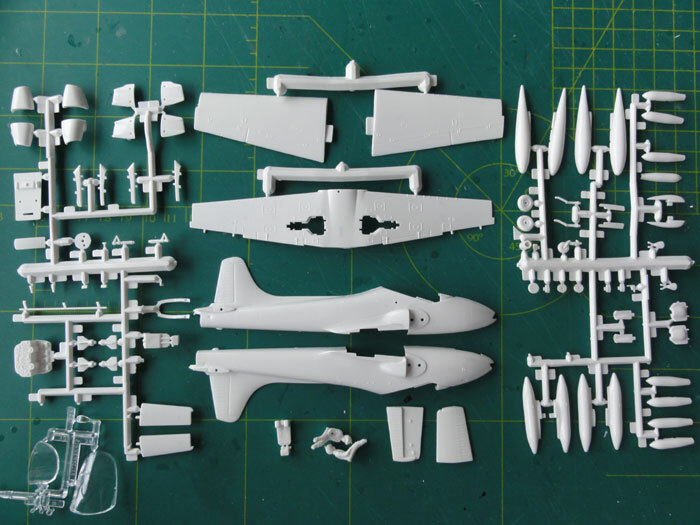 Many parts are for the stores that comprise wing tanks, drop tanks, bombs. The kit has raised panel lines, I left them that way. When the model is painted it will only be seen at a distance that they are raised and not inscribed. 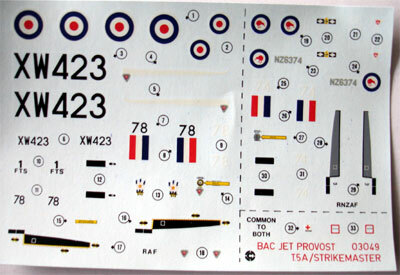 On the recently bought Airfix kit, the decals are much better and for a RAF and New Zealand scheme. They are also different as the first kit release seen above. 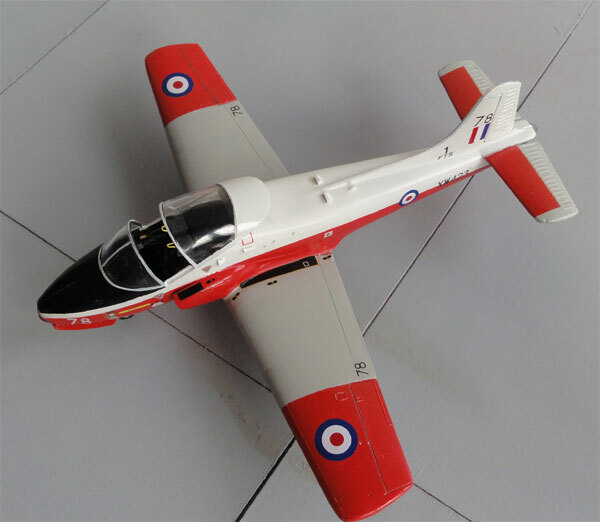 Thus 2 models were made of the Jet Provost T.5 version. On the real aircraft almost always the undercarriage gear doors are closed on the ground, so there is no need for an actual nose wheel bay, nor any details inside the bays. This model really is further a straight forward build, and the model was further made as per instructions. 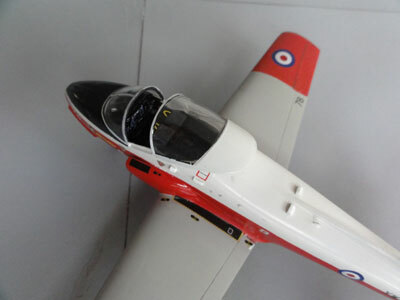 I had some small difficulties to fit the nose strakes (parts 44 + 45) typical for the later Jet Provost. (These strakes helped with spin training). Seen are the two inside gear doors (parts 52) in closed position, sand as needed to get a good fit. Gap filling with rod was needed at the mid lower wing area. For the Jet Provots, no wing tip tanks were fitted. I always saw in the control surfaces with a TIGER razorsaw, like the ailerons, rudder and flaps. This makes things look better. 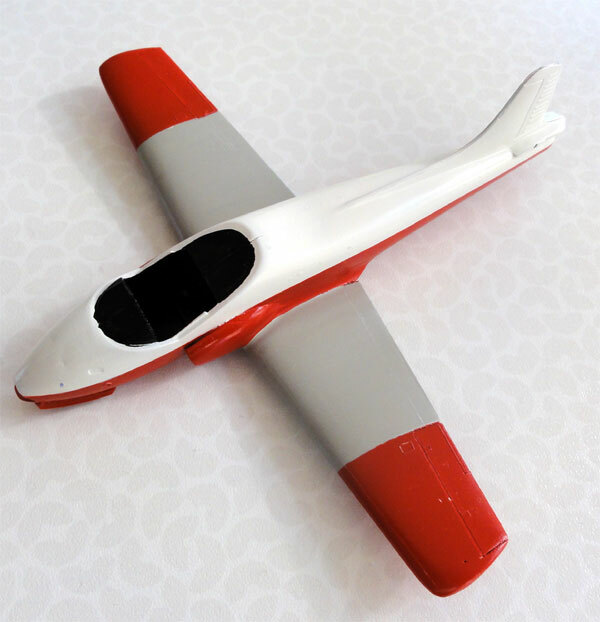 On a model, the ailerons were set at an angle: one down and reversed one slightly up. 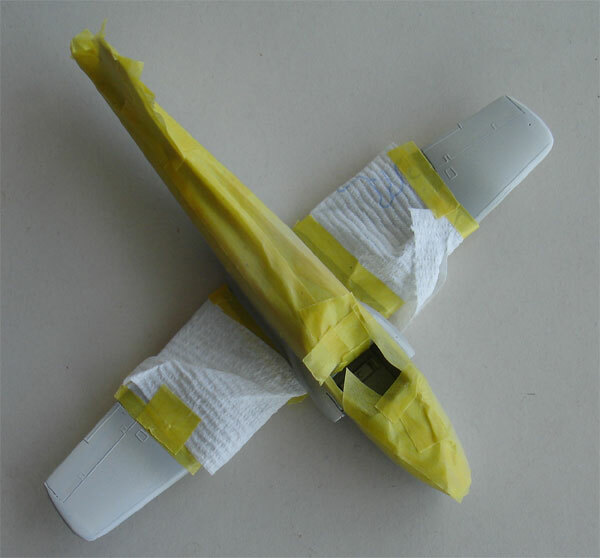 Filler was needed particulary at the intakes and the wing root joints. Small amounts of putty were set and sanded after drying out. 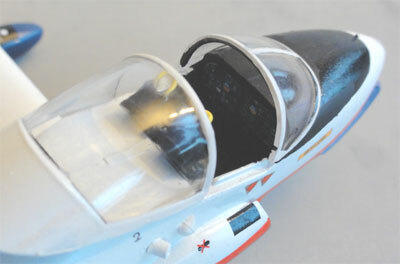 The kit cockpit has two seats that can benefit from some extra detail as well as the cockpit itself. ( A PAVLA resin set can be bought for this, but I simple added details with some plastic card and rod). 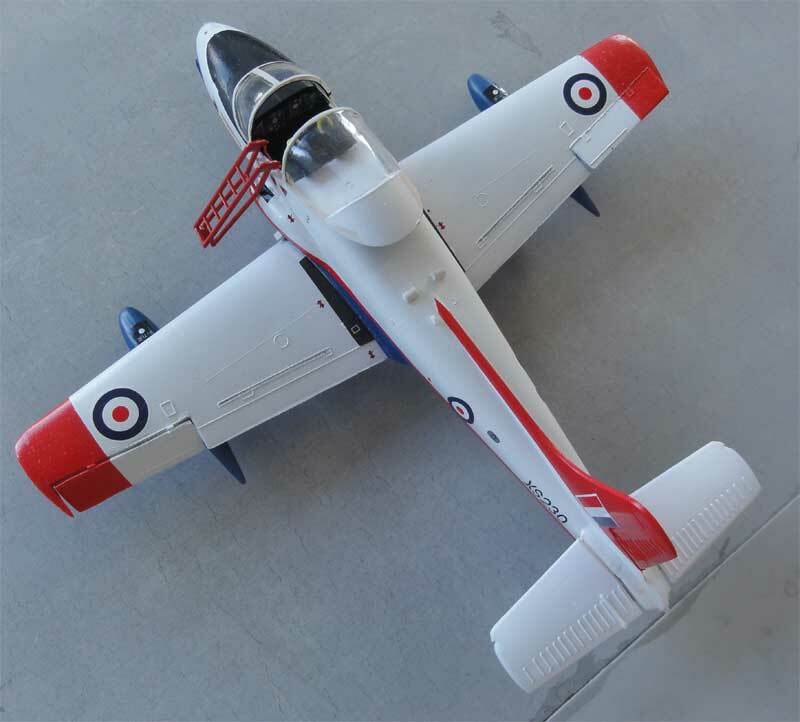 Two models were thus made and when both assembled, they were ready to get the paint schemes. 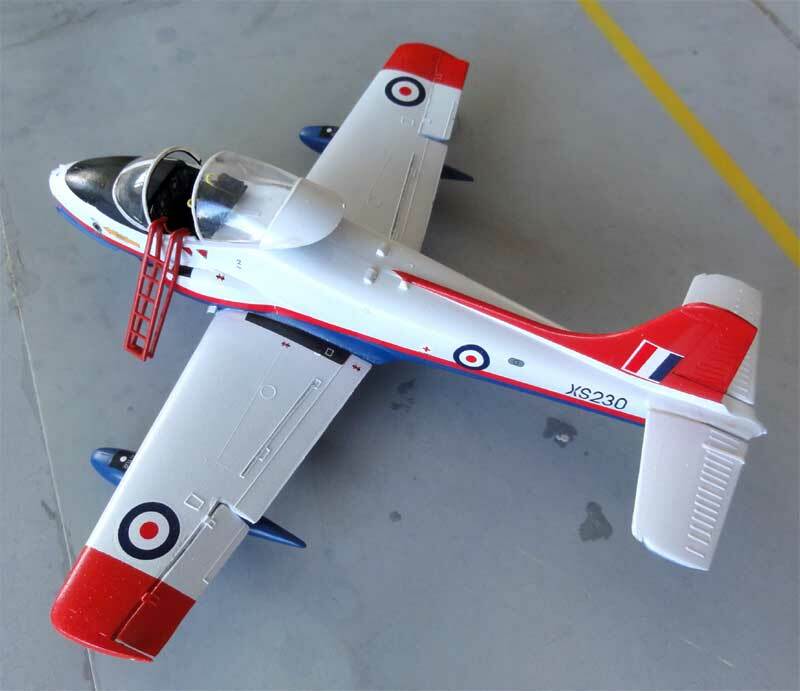 The first kit was made in a scheme of a Royal Air Force trainer in red-white-grey using the later AIRFIX kit decals which were OK. Here two old photos I took at the Air Tattoo at Fairford, probably in the early nineties. 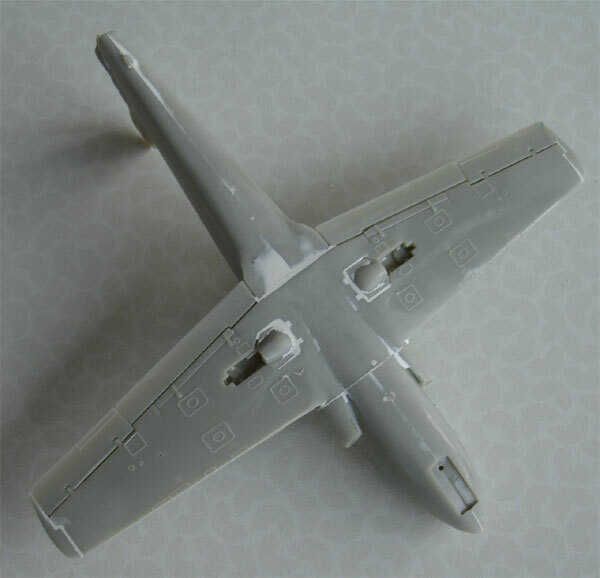 Most work with this scheme is to apply with the airbrush the colourfull decal scheme of white, red and grey wing panels. The colour scheme was applied as indicated in the instructions. First, the overall model got a light grey base coat. Correct any irregularities as needed. - inside the canopy, I made a piece of flat card to close the huge gap the lower gap and a bulkhead inside the canopy. - the seats got each a ejection release handle on top. 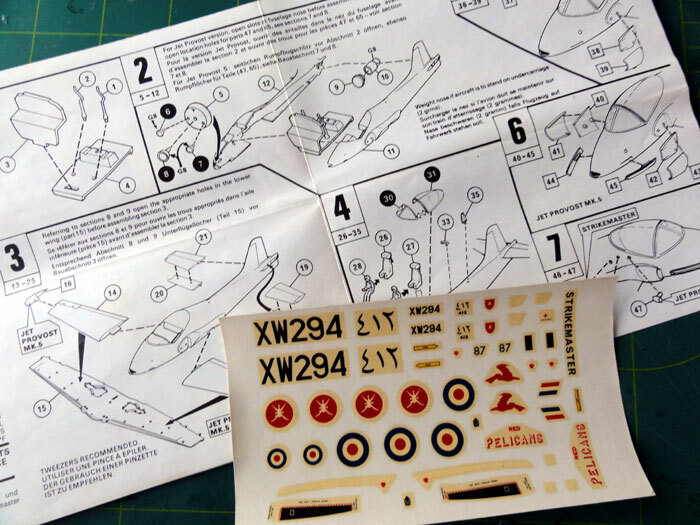 - for the instrument panels, decals were used from the decal spares box. 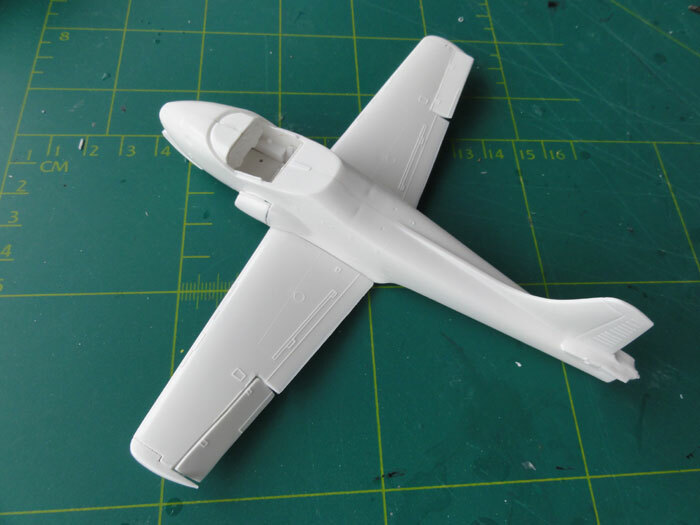 A little wash only was applied on the recessed panels of the ailerons and flaps with PROMODELLER wash. Finally the model got a decal protecting gloss coat of Johnson Future/ Pledge with the airbrush. 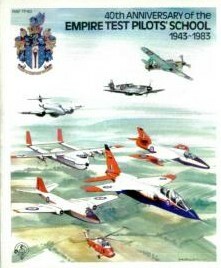 A nice addition to my RAF British trainer model collection. 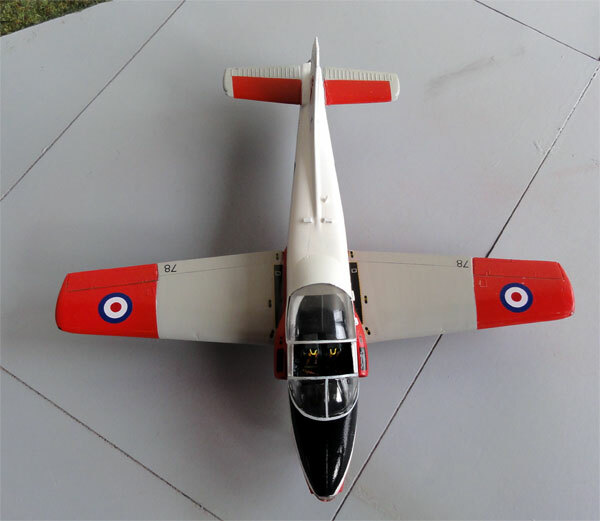 The second model was finished as a Jet Provost test aircraft at the Empire Test Pilots School at Boscombe Down, UK, 1995. I got a nice decal sheet from AIRDECAL, set 7211, Raspberry Ripple PART 2. 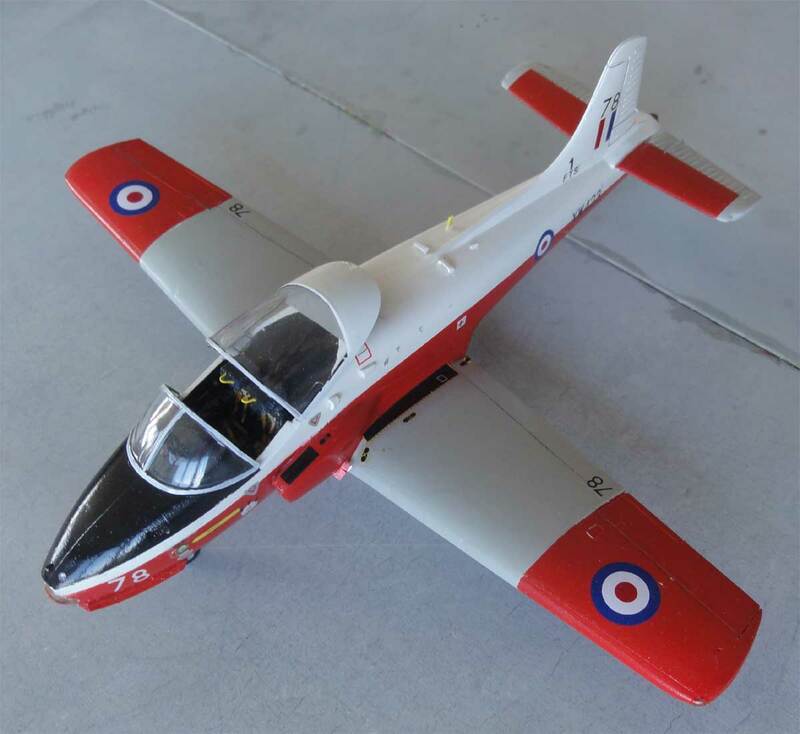 It has decals for a Jet Provost with serial XS230. 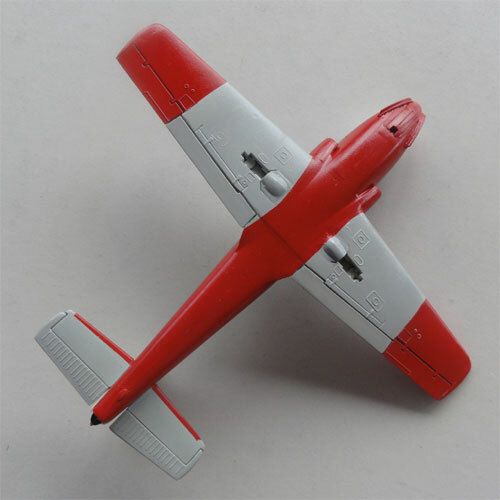 The Bedford paint scheme is quite challenging, but fortunately the AIRDECAL sheet does provide the red demarcation lines and the decals are accurate. 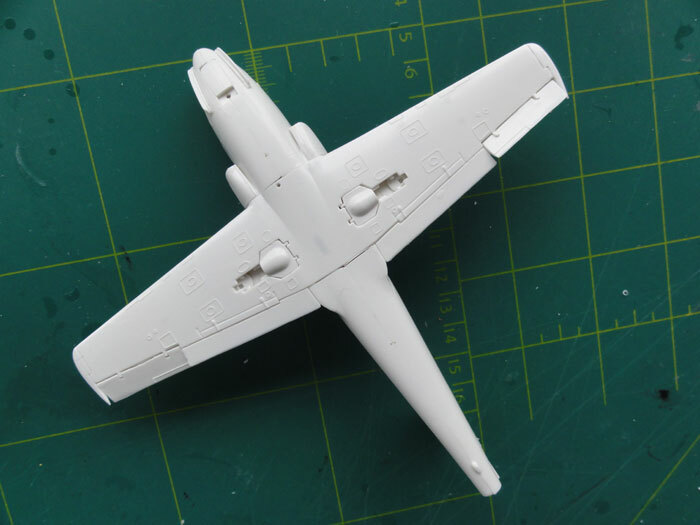 Start with a light grey base coat using your airbrush. Then do the white overall, mask the red and do the blue. The AIRDECAL decals are quite brittle buty went on fine. 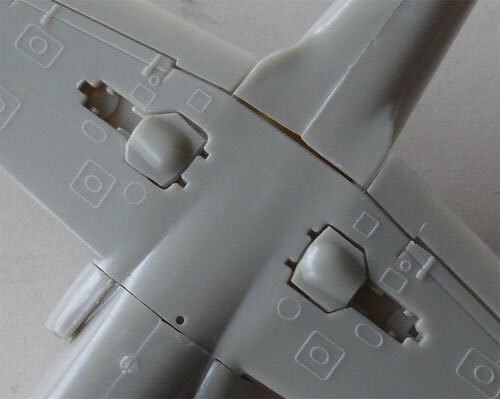 After applying the decals as per instructions, the final small parts were set onto the model and the cockpit a bit detailed, see above how. Also this model got a decal protecting coat of Johnson Future/ Pledge with the airbrush.